Every state has it's own ATV laws and regulations. 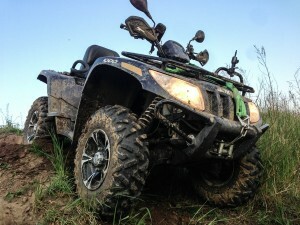 The laws and regulations listed below are meant as a quick reference for ATV riders. It is your responsibility to know all ATV laws before riding. For a list of ATV laws and regulations in Wisconsin, take the time to review at the Wisconsin Department of Natural Resources. All riders over the age of 12, are required by law to complete an approved ATV Safety Course, and carry the Wisconsin ATV Safety Certificate while riding on public lands. Children under the age of 12 may operate a small ATV and only a registered four-wheel ATV that's 90cc or less. They may only operate on a designated off-road ATV trail. They cannot cross a roadway or operate along any roadway, even if it is defined as an ATV route. They may not ever operate on frozen surface waters under any circumstances. Riders under the age of 12 must be accompanied by a parent or legal guardian at all times, aunts, uncles, siblings, grandparents or friends do not meet this requirement. The accompanied parent has to be in continuous verbal contact with their child. The child must be wearing a helmet at all times. All ATV riders in Wisconsin should wear an approved helmet at all times when riding, regardless of a person's age and experience level. In Wisconsin, a helmet is mandatory for all riders under the age of 18. Always wear appropriate safety gear when riding. Ensure your ATV is registered in the state. Always stay on designated trails. Obtain landowner's permission before going onto private land. Before heading out, contact the landowner or land management agency to find out about open ATV trails or routes. Under NO circumstances, should anyone ride an ATV while under the influence of drugs or alcohol. As you may know, using the right products on your ATV, such as the best synthetic oil in Bear Creek, WI is key in ensuring that it will perform as expected. Not only that, but the added benefits that AMSOIL products can bring can also give you smoother and more enjoyable rides. That's why, if you're in need of synthetic lubricant, remember that Superior Synthetics LLC is here to help you to choose the best AMSOIL Synthetic Oil for all your engine needs. When you need AMSOIL Synthetic Oil and lubricants in Bear Creek, WI, call (715) 823-6525 or contact us today. You can also visit our online shop to place an order.